What is a Sickle Cell Anemia Test? Normally, red blood cells are flexible and are shaped like round, flat discs with a slight indent in the middle. These rounded edges and structural flexibility allow for the blood to flow seamlessly through the body. Sickle cell anemia is a rare, genetically-inherited disease that changes the properties of the normal red blood cell. 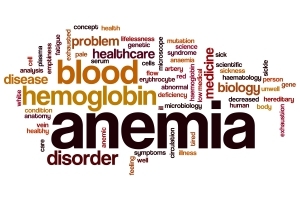 Sickle cell anemia is caused by a mutation in the gene that tells your body to make hemoglobin, the red, iron-rich compound that allows red blood cells to bind to oxygen from the lungs and carry it to all other parts of the body. Because of this genetic mutation, the hemoglobin produced by the body is abnormal, which in turn causes red blood cells to become rigid, sticky, and misshapen to the point where they resemble sickles or crescent moons. The red blood cells deform because they contain an abnormal type of hemoglobin, called hemoglobin S, instead of the normal hemoglobin, called hemoglobin A. Because of the irregularity in their shape and rigidity, these cells can get stuck in small blood vessels, which can slow or block blood flow and oxygen to parts of the body. The sickle cell gene is passed from generation to generation in a pattern called autosomal recessive inheritance. This means that both the mother and father must pass on the defective form of the gene for their child to become affected. If only one parent passes the sickle cell gene to the child, that child will have the sickle cell trait. With one normal hemoglobin gene and one defective form of the gene, people with the sickle cell trait make both normal and sickle cell hemoglobin. Their blood might contain some sickle cells, but they generally don’t have symptoms; however, they are still carriers of the disease, which means they can pass the gene to their children. Sickle cells break apart easily and die, leaving the body without enough red blood cells. Red blood cells usually live for about 120 days before they need to be replaced. But sickle cells usually die in 10 to 20 days, leaving a shortage of red blood cells (anemia). A Sickle Cell Anemia blood test checks for the presence of hemoglobin S, the defective form of hemoglobin that underlies sickle cell anemia. In the US, this blood test is part of routine newborn screening done at the hospital, but older children and adults can be tested too. If the screening test in negative, there are no sickle cell genes present. If the test is positive, further tests are done to determine whether one or two sickle cell genes are present. If the presence of sickle cell genes is positive, your doctor may order an additional blood test to check for a low red blood cell count (anemia).